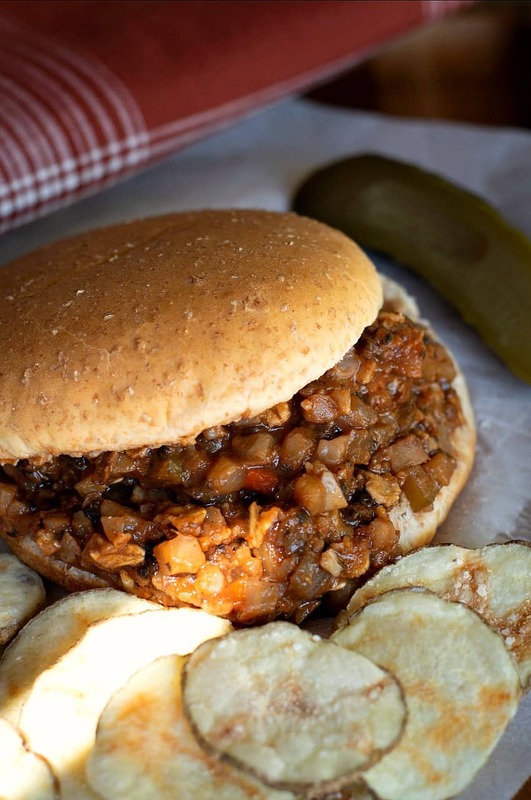 One of my readers asked me the other day if I had an Instant Pot Vegan Sloppy Joes recipe. The answer is….I DO NOW! So quick, so easy, and SO tasty! I simply sauteed a little onion and bell pepper in my Instant Pot. Tossed in some Celery and Garlic for color and aroma…. then added my Cauliflower/Mushroom Taco mix for the ‘ground beef’. A little ketchup and a few spices…..
Boom! 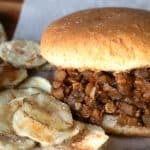 Instant Pot Vegan Sloppy Joes. 5 minutes in the Instant Pot…..that’s it. 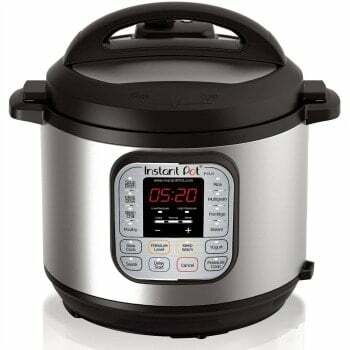 And for those of you who ask, yes I LOVE my Instant Pot, almost as much as I love my Vitamix. Get one – you will never look back! Here’s a link to mine and remember – this IS an affiliate link so I will make a small commission if you buy one. Those are homemade Potato Chips. They’re seriously easy to make. Thinly slice a potato using a Mandoline Slicer (please be careful and use the food guard!) and place your ‘chips’ on a piece of parchment paper. I like to sprinkle a little garlic powder and kosher salt on top, then microwave for about 7-8 minutes or until they crisp up and begin to brown. That’s it, super easy. Now, about those Vegan Sloppy Joes…..
Add 1/2 cup of finely diced onion, 1/4 cup of finely diced red bell pepper, 1 small rib of finely diced celery, and 2 cloves of finely minced garlic to your Instant Pot. To make a quick job of all of this dicing, I simply add my mushrooms, cauliflower, and walnuts to my Vitamix blender and pulse it a few times. Better than any food processor! This cauliflower/mushroom/walnut mixture will become the ‘hamburger’ of the Sloppy Joes. Stir all that into the onions and add 1/2 cup of water, 1 tablespoon of Vegan Worcestershire, 1 tablespoon of Low-Sodium Soy Sauce and 1/2 tsp Chili Powder. Once that is all mixed up, we’re going to add the following to the TOP of the mix, but we are NOT going to STIR anymore. Just let it sit on top. Again, we do NOT want to stir this in because the tomato sauce in the ketchup tends to scorch in an Instant Pot if it’s touching the bottom or sides. So just lay it on top and we’re good to go. Attach the lid, set the vent valve to SEALING, and press MANUAL for 5 minutes. Once it’s finished cooking, allow it to Naturally Release (NR) for 10 minutes before removing the lid. NOW you can give it a stir. And if it’s thin and watery (like mine was) add 1/4 cup of dry, old-fashioned rolled oats. This will quickly soften and absorb the excess liquid. For a final touch, I like to stir in a little 1/4 teaspoon of Red Wine Vinegar. These are way better than any Sloppy Joes I remember as a kid, and certainly better than that ‘canned’ stuff you see in the stores. Give it a try, and let me know how you liked it. I’m #brandnewvegan on Instagram so send me a pic! Until next week…..KEEP ON COOKIN’! 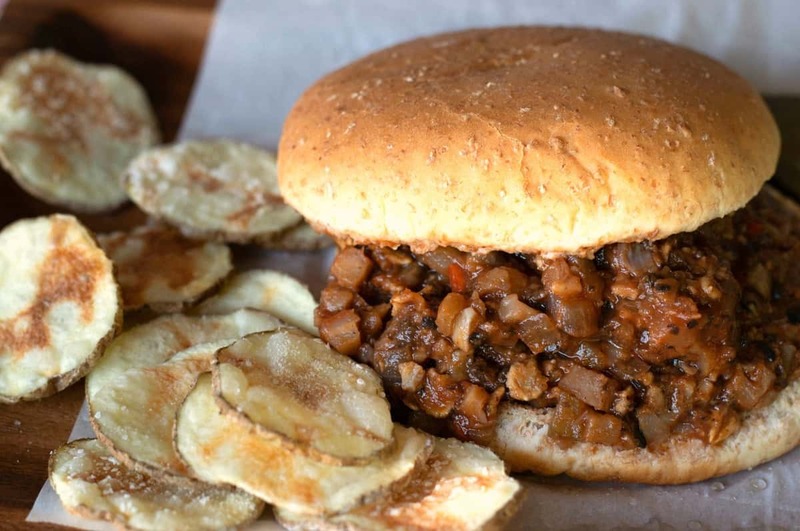 One of my readers asked me the other day if I had an Instant Pot Vegan Sloppy Joes recipe. The answer is….I DO NOW! So quick, so easy, and SO tasty! Add cauliflower, mushrooms, walnuts, water, worcestershire, soy sauce, and chili powder and stir to mix well. Layer the ketchup, maple syrup, and mustard on TOP of the mixture but do NOT stir. Attach lid, set vent to SEAL, and cook on MANUAL for 5 minutes. Let it naturally release the pressure for 10 minutes before carefully opening lid. Stir, and if it’s too thin and watery – go ahead and stir in the oats. I really liked this recipe! I put a portion over some cornbread that I made . I have not made any brandnewvegan recipes until I saw this one. Because I have read many good reviews, I thought I would give it a try ! Now I must look at some others ! Thank you ! Just to confirm: is it correct that you microwave the potato chips for 7-8 min or are you baking them in the oven or toaster oven? I didn’t think the microwave would crisp anything as you mention here. Thanks! Microwave – try it and see! This site is awesome. Stumbled upon it in my search for a vegan stew that would still be hearty. Super excited now to try all the different recipes!!! !